And now it is time for the final part of my look at the 20 colors of the Papermate Flair pen. This section only has 4 pens, and it’s special because I couldn’t find names for these colors from any official source. So the 4 names presented here are just what I think most represent the colors. Let’s get started and wrap this up. Maroon – I love a good maroon shade, and this one does not disappoint. It’s easy enough to tell, even amongst other dark colors, what it is, and the tone is nice to look at. It might not be the most natural maroon I’ve seen, but it’s quite good, and sometimes it may even be work compliant. It doesn’t smear much but it’s not the best at resisting water, either. Brown – The brown is a nice dark, UPS, brown. It doesn’t quite look like dirt, more like bark, and it barely smears. It’s easy on the eyes, blends in with dark colors, and could work in some office settings. Caramel (error in image where this is labeled as Sepia and Micron Colors are switched) – Caramel is the color I’ve had the hardest time naming. I just don’t really get this light brown. It looks fairly standards, but it’s a bit off from the browns in Micron, Crayola, Pilot, and other such brands. It looks all right, but not the most natural, and most workspaces wouldn’t appreciate it. Although smearing is next to none. Grey – And the final color is also one of the most boring. Grey is a color I love that isn’t featured in many color sets. And that’s because there isn’t much use for it. In nature I can only think of fog, and in an office only if you convince them it’s just your black pen running out. That being said, it’s a nice dark, even grey with very minimal smudging and feathering. And there we are, the 20 current colors of the Papermate Flair. I do like them, and even some of the more garish colors are better in these sets than others. There’s a good mix of water resistance, workspace appropriateness, and personality in there. And I would recommend the set if you like tones of colors and like the Flair. But it’s a bit expensive and maybe one should consider the smaller sets if they want specific colors. This week I’m gonna take a look at some of the weirder colors of Pilot’s G2 pens. Let’s dive right in. First up is teal, which is a deep, bluish-green, almost like an aquatic plant. It’s very subdued and seems almost workplace-friendly (sort of like a blue-black, but with green). It goes on the page a bit thick and is a bit of a hard start when it’s not been written with for a while. A very soothing color overall. Next up is hunter green, which is a deep, swampy green. It looks like a camouflage color, which I guess it’s supposed to. It isn’t the most pleasant of colors to stare at, but it is quite subtle. This color is probably the thickest ink and has the most problems with startup and skipping of the bunch. Third is navy, which is a blue-black. It doesn’t really remind me of any previous navy colors I’ve seen, it is simply a very dark blue, but not a deep blue. It looks just like a combination of blue and black. Very work-friendly, I would say, but has no real art application save for maybe a night ocean. Fourth is periwinkle, which is a light, sky blue. This is one of the lightest and easiest to read light blues I’ve seen. It isn’t quite as light as possible, but that makes it readable. It has a bit of shading (inconsistent color) but not too much. This is likely the most versatile ink color of the bunch, being a close to work-friendly “happy” color, and a realistic color that could be found in both water and skies. And finally is caramel. Caramel is a light, almost hard-to-read brown. Again it is subdued enough to not hurt one’s eyes, but is very light and not particularly pretty. It does flow well, and really looks like caramel, so if you need a caramel colored ink, this is the ink for you. 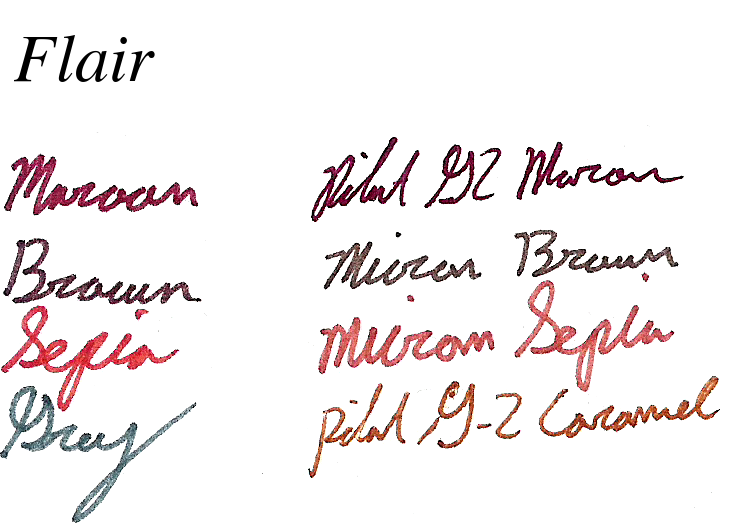 That concludes my look at the Pilot G2 pen color types. I hope these were useful, they really do cover the gamut and provide ink colors for a variety of different uses. Unfortunately, I believe they only come in a large, expensive pack, so I would recommend having uses for a few of these pens before purchasing them. They are great reliable writers with most of the ink colors, especially the more common ones (which are available individually) and can be used almost anywhere.